Shane's first novel is heavily influenced by the incredible people he has met and the journeys he has been fortunate to have experienced over the past two decades. 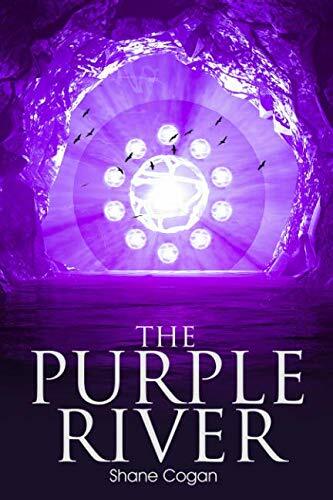 THE PURPLE RIVER is a fantasy/sci-fi novel with a dystopian theme. The story develops with news of a crime on Planet Atis in a distant galaxy: the wife of King Fareth has disappeared, with a bullet found at the edge of a lake where she was last seen. However, the incident is highly unusual as there has been no crime whatsoever on the planet for 300 years. Planet Atis has no army, police force, security or any form of guards. Puzzling as this crime looks, it’s not the heart of the mystery. Coupled with this crisis, there are murmurings of strange dark deities (borrowed from Celtic mythology, such as the Balor, Naiads and the Kelpie) on the planets highest mountain, and shape shifting creatures in the dense forests, close to the Palace and capital city, where most of the populace live. The ruling tribe of the King, The Tarracullans, are also being threatened by their historical enemy, the Yarracullans. There is also the presence of a sole survivor on another planet, whom are on a journey of self discovery while learning the five senses. Who exactly is this other being on another planet and are they connected to Atis? Who are these new dark deities that reside on the planet’s largest mountain? And what is it with the Kings brother and his special telepathic power and magic in the nearby forest? In short, its a story about magic and tribal conflicts. A world in denial about its violent past. Planet Atis appears peaceful, but faces a battle for survival against underworld deities. The Purple River is out now on Amazon.